In an unusual move, Agriculture and Agri-Food Canada has undertaken a third assessment for the federal livestock tax deferral. “Federal officials are currently finalizing the analysis to identify whether any additional regions have met the criteria for the livestock tax deferral,” AAFC spokesperson James Watson said. Under the deferral plan, cattle producers affected by severe drought or excess moisture can defer a portion of their income earned from selling part of their herd provided they are in an area designated as meeting AAFC’s requirements. 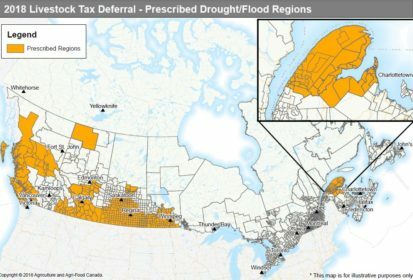 Parts of six provinces stricken by drought in 2018 were designated in the initial assessment in September: British Columbia, Alberta, Saskatchewan, Manitoba, Quebec and New Brunswick. Additional parts of those provinces were included after the second assessment in November. The full list of designated regions is available online. Once the analysis of the third assessment is completed, and should new areas be added, Watson said AAFC will announce its findings on the livestock tax deferral website. The idea of a third assessment was something of a surprise to Brady Stadnicki, policy analyst with the Canadian Cattlemen’s Association (CCA). “I think it’s a bit rare for the third assessment,” he said. However, Stadnicki is hoping parts of Ontario, which were not part of the previous two assessments, will be added in the third. These include Leeds and Grenville United Counties, the counties in Manitoulin District, Grey County and others. Following a request from Beef Farmers of Ontario, provincial Agriculture Minister Ernie Hardeman said in mid-November he would ask the federal government to designate “significantly impacted” areas of the province for the deferral. Also, Stadnicki said, there are other areas of New Brunswick the CCA wants added and Nathan Phinney, chair of the New Brunswick Cattle Producers agreed. He pointed to the northwest corner of the province, especially around the Edmundston area, as particularly drought-stricken. Nevertheless, he’s pleased more areas of Manitoba could be added. One concern Stadnicki, Phinney and Lemon share in regards to the deferral is geographical boundaries AAFC uses for its assessments. Municipal boundaries were used in the three Prairie provinces, while consolidated census subdivisions were used in British Columbia, Quebec and New Brunswick. But often, smaller areas within those boundaries are stricken with drought are overlooked and not eligible for the deferral, the three said. “Perhaps municipalities are not the appropriate unit for assessing the livestock tax deferral?” Lemon questioned, noting this has been an issue often discussed at MBP district meetings. “It could be more producer-specific. There seemed to be so many little pockets here and there,” Phinney said of New Brunswick.